NFL legends are just like us! They laugh, they cry, and they even group chat! Together, in fact. That’s how many of the key members of the 1999 St. Louis Rams stay in touch. That chat is particularly active this week, because the Rams are back in the Super Bowl in search of their first Vince Lombardi Trophy since that 1999 team beat the Tennessee Titans in a thriller. Just like in 1999, the game is in Atlanta. Just like in 1999, the threat of inclement weather conditions has hovered over Super Bowl week. And just like in 2001, when that Rams team last appeared in a Super Bowl, it’s the Patriots and the Rams in the big game. The contemporary Rams — now based in Los Angeles, of course — are also wearing their throwback uniforms, and several of the best players from that era’s St. Louis-based team will be working hard on game day. 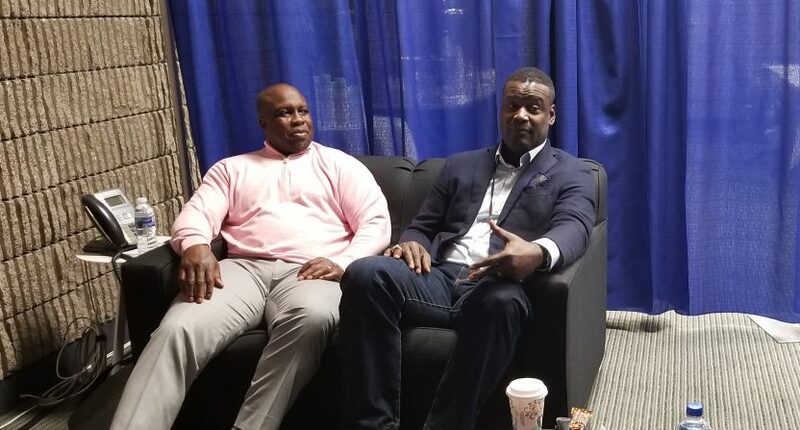 Warner, London Fletcher and Kevin Carter are all covering the Super Bowl as analysts — Warner for NFL Network, Fletcher and Carter for CBS Sports — and they’re all feeling nostalgic this week in Georgia’s capital. Fletcher also notes that both the 1999 Rams and the 2018 Rams possess(ed) world-famous offenses and less-heralded defenses. But he and Carter were quick to point that that their unit was underrated, and they’re right. That Rams D was actually the top-ranked unit in the league against the run, they created more takeaways than all but five other defenses, and — as Fletcher was eager to point out — they were the top-ranked scoring defense in the NFL entering the final week of the regular season. Fletcher, Carter and Warner are deeply proud of what that team accomplished, and they’re also happy that they’ve remained in touch. They estimate that about 90 percent of the ’99 roster returned for a 15th anniversary celebration a few years ago, and they note that their respective careers in television have helped foster an ongoing camaraderie. Carter, who served on CBS’ Super Bowl live program this week, points out that “when you leave the game, the music stops. All you’re left with is the memories of the relationships that you had in the locker room.” But he says life in broadcasting has enabled him to maintain those relationships in a team-like atmosphere. Not only are he and Fletcher teammates again as CBS Sports colleagues, but they’re joined by CBS game analyst and fellow ’99 Rams alumnus Trent Green. And Carter says the bond between the three is critical when any combination of the trio is on set together. “They can pick up on things because we know each other,” he said. It helps that they continue to rib each other both on air and online, where their group chat rages on. “That guy” who sends too many messages? Fletcher and Carter agree it’s former defensive back Dre’ Bly, who was a rookie sensation with that ’99 squad. But it’s all in good fun, and the crew remains close — thanks partly to the internet and partly to an industry that continues hire and champion former NFL stars.